Rooms are spacious,clean. Restaurant food was awesome! 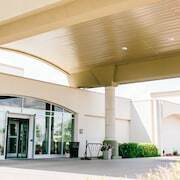 Where to find Stony Mountain hotels near an airport? 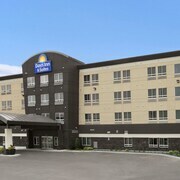 Where can I find hotels in Stony Mountain that are near tourist attractions? Unfortunately Expedia has no accommodation options within Stony Mountain proper, but our comprehensive database offers an extensive selection of short and long-stay options in the wider region. While you may not find a place in Stony Mountain, rest assured that Expedia lists approximatley 62 fine options within a 0.1-kilometre (0.06-mile) radius. The closest Expedia hotel is the Inn At The Forks, Manitoba, which is located 25 kilometres (14 miles) from the middle of Stony Mountain. Alternatively, you could check out the The Fairmont Winnipeg, located in Manitoba, which is 20 kilometres (14 miles) away. You could try the Delta Hotels by Marriott Winnipeg as well as the The Fort Garry Hotel. 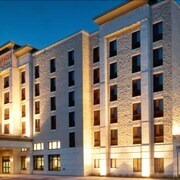 The Delta Hotels by Marriott Winnipeg can be found 20 kilometres (14 miles) from downtown Stony Mountain. The The Fort Garry Hotel, is positioned 25 kilometres (14 miles) away. 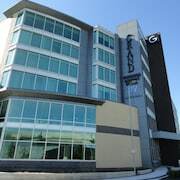 The Four Points by Sheraton Winnipeg International Airport and also the Fairfield Inn & Suites by Marriott Winnipeg are two other Expedia-listed hotels around Stony Mountain. Looking for more to do? Why not spend some time exploring Marine Museum of Manitoba and Selkirk Golf and Country Club, in Selkirk, 25 kilometres (15 miles) to the east of Stony Mountain. Selkirk hotels are the Evergreen Gate Bed and Breakfast and Canalta Selkirk. 25 kilometres (14 miles) to the south of Stony Mountain, is Downtown Winnipeg, home to the Radisson Hotel Winnipeg Downtown and Mere Hotel. The Variety Heritage Adventure Park and Masonic Temple are a couple of the more popular attractions to see should you visit Downtown Winnipeg. Get your sports fix by taking a trip to MTS Centre, which is 20 kilometres (14 miles) to the south of Stony Mountain. Stay close to the action at the Humphry Inn & Suites or the Holiday Inn and Suites Winnipeg Downtown. Winnipeg International Airport is a convenient airport for accessing Stony Mountain. It is 20 kilometres (12 miles) drive away. If you choose to stay nearby, try the Clarion Hotel & Suites or Holiday Inn Winnipeg-Airport West. What are the most popular Stony Mountain hotels? 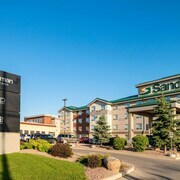 Are there hotels in other cities near Stony Mountain? What other types of accommodations are available in Stony Mountain? Explore Stony Mountain with Expedia.ca’s Travel Guides to find the best flights, cars, holiday packages and more!